Koh Phangan is a fairly large island, so since we’d been limited to only a small section of it during the Full Moon Party, about 8 of us moved to the central east coast of the island to investigate what else the amazing isle has to offer. Than Sadet was desolate and difficult to travel to, we had several near death experiences in the back of Pong’s truck on the trek out there. No cell phone or Internet service, ATM’s, or minimarts exist in the isolated region. Than Sadet is the kind of place people from around the world go to get away from it all for peace, quiet, and inaccessibility. The 8 of us kind of ruined that peace for a few visitors. Mai Pen Rai (meaning “no worries” or “nevermind” in Thai) is the name of the bungalows we stayed in for the next few days. The bungalows were literally tree houses placed on the side of a rocky hill. 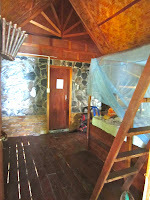 To get to your room, you had to walk across the beach, squeeze through a crack in between two huge boulders, and then hike up the rocky hill to get to your tree house. Definitely not wheel chair accessible. A few of the girls with larger suitcases couldn’t even bring their luggage to the room because it couldn’t fit through the crack in the stones. With my big pack on my back and my small backpack on my front, I felt like a pregnant girl giving a piggyback ride to a toddler up a mountain. The komodo dragon in the bathroom. 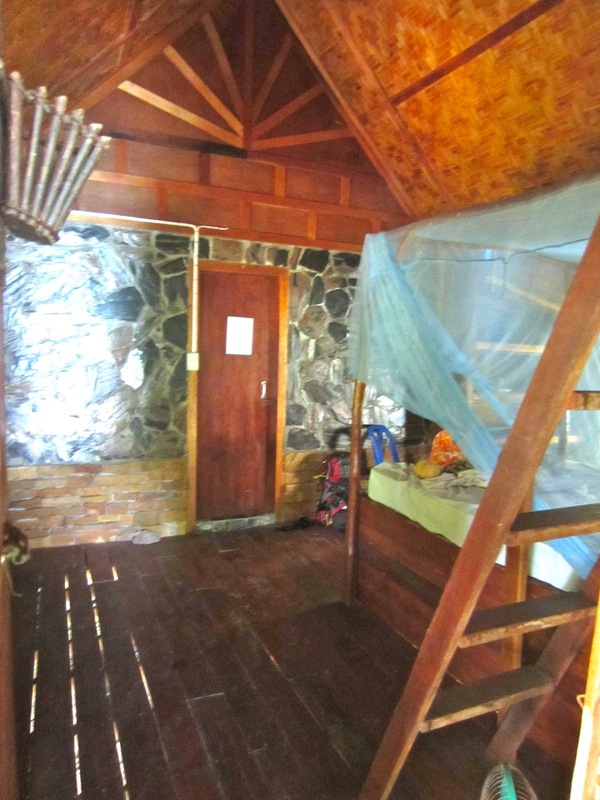 Four people stayed in each tree house and in mine had a double bed down stairs and 2 mattresses on the floor in the loft. Both protected with mosquito netting for nighttime. The komodo-sized lizard that stared at me while I used the bathroom was included for free. The room was swarming with insects, lizards, spiders, and other unidentified creepy crawlies. I guess that’s what you get when you are in a tree house! Once we settled our things, we set out to discover a few of the many waterfalls in the area. Wandering down the road in search of waterfalls. We climbed up and down the steep rocky dirt road checking out waterfalls ranging from stream sized to swimming pool size. 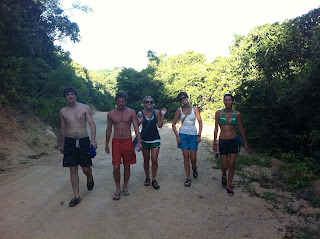 I climbed rocks and used a rope swing to repel off the rocks and swim in the shallow and refreshing pools. Eventually, everyone headed back and two friends and I strolled off the beaten path and ended up in a palm tree covered forest with coconuts everywhere! During our mission to break open a coconut, we lost track of time and the sky faded into a pitch-black abyss. We had been working so diligently busting coconuts, that’s what she said, we found ourselves sitting in the middle of a dirt road covered in coconut debris in the dark. Luckly, one of us had a tiny flashlight that helped guide our path back to Mai Pen Rai. On route back, we had to take a moment to turn the flashlight off in the middle of the woods to stare up at the sparkling sky. The night sky in Koh Phangan was the most beautiful sky I’ve ever seen. The stars cover every inch of the clear obscure sky like diamonds spread across a black velvet cloth. There were so many stars we were making up our own constellations, my personal favorite: the dog on a leash. Getting caught in the hammock. By the time we made it back, it was time to meet the others for dinner and drinks at one of the two restaurant around for miles. We sat around a log table on the floor playing games like Banana-Grams, Catch Phrase, and Contact. The small group of us is having a grand ‘ol time and then at midnight all the lights went out! I’d read about places that turn the electricity out at certain times, but when you check in the staff should give you a heads up and warn you on what time the power is on and off. We didn’t get the memo. Our night it just getting started but when the clock hit 12, we needed a new game plan. The party moved to the beach since it was the only place that was semi-lit up from the moonlight. We climbed up rocks and jumped into the ocean not realizing we were being loud but I suppose since there was nothing else going on besides sleep everyone on the beach heard us. An older British lady came to shore and yelled at us for being “loud American tourists.” Yes, it was disrespectful of us to be loud so late at night, especially when this is a place where people go to get away from the noise and chaos but she had a bone to pick with Obama because she went off on Americans. However, we were apologetic and as soon as she voiced her concern we piped down and went to sleep. The only thing a bit out of line was the loud American comment - from that point on I was “Canadian” whenever someone in the group was inappropriate. It was difficult getting back to the room in the dark and I crawled onto my mattress sopping in salt water and covered myself with mosquito netting. There was no sleeping that night with crazy animal noises all around me and a lizard pawing at my head at one point! The next morning we got beaucoups of evil eyes from the guests at breakfast. Make sure you are respectful if you go to one of the remote areas of any island! The rocky path to get to our room. A lovely view of the beach. View from our tree house! $6 a night y'all! Looks like you found paradise. At least you were busy making memories while the best the old lady could do was dream about making some. ARE busy!! haha tjanks Trent, i am having an amazing time exploring!